I'm not sure what there is to address if "scrape rate" is "less than contemporaries"? I don't know if the contract says that the KC-46 cannot scrape a stealth airframe or if the issue is that sometimes the boom operators do not detect that they have scraped an airframe (which has happened). Boeing is working on improving the contrast of the Remote Visual System so operators can better detect when a scrape has occurred. Boeing pays to get to "contemporary" level, USAF pays to get to "less than contemporary level" doesn't make much sense to me. Now we know how they came up with the saying "it aint rocket science"
I can only assume there is someone out to punish Boeing for past sins / wrongs, when one considers how long the US Air Force has said they need new tankers and the 135's are failing, etc etc etc the mind boggles. We should also note that the Air Force wants new shiny toys, the cost of the F-35 continues on it escalation path, spare's now seem to be an issue, propriety material another and a new bomber is on the way so getting rid of the A-10, B1 and more B-52's will not cut it. I admit that we will try to make sense of this, but really based on what we know, military a/c spend more time in maintenance after normal ops, I would be shocked that they do not inspect refueling contact points on a periodic basis, heck even when I watch video's of the process you can sometime's see the contact. I guess the next thing would be quantifying how much fuel is lost when the boom disconnects and we see that spray of fuel. I wonder if the high scrape rate takes into account the learning curve? After all, are we not dealing with a new boom, new aerodynamics and camera system? Even with highly experienced operators, you would expect a learning curve. Perhaps they are not coming down the curve as fast as they would like? Perhaps they need more feed back to the simulators to accelerate the learning curve? And yes, all of this would contribute to a delay. Even if that is the case, that is a US Air Force specific training issue which can be added to future contracts, but to use that to delay delivery of frames that have already been delayed for over a year and over a decade or more via the purchase process makes no sense. Technology can be used to assist, why not have a low energy radar with computers taking over both a/c after they get within a certain distance of each other to automate the process? Future tech is coming when drones are deployed and need refueling, but as of now, it is not advanced to the point to delay a project that probably did not get too specific on those requirements in the approved purchase. The USAF has stated there will be more training of operators on the RVS to try and help reduce these scrapes. Inspecting the large "stealth paint scraper", in front of 76030, one of the recent built KC46A's from LRIP batch #3. Surprised to see it painted, since there are so many unpainted earlier built frames. Unless most of them are painted by now too? I wonder if they could use those plastic film used the front end of car hoods to resit paint chipping and dings. Drogue refuelling has a slower flow rate. Tactically it means the receiver spends more time pulling gas from the tanker, and spending gas doing it, compared to a boom receiver. That higher flow rate from a boom only comes into play when refueling aircraft such as the B-52, C-5, C-17 etc. You use the same flow rate on am F-15 as you would a C-17 and you'll burst the fuel cells. Probably not. It would likely destroy the stealth characteristics even more than a scratch would. some kind of bonnet bra. you could use some HF absorptive cloth? Good news for the KC-46 program in the Congress Omnibus spending bill with the KC-46 getting an additional three airframes funded above US DoD requests. The Air Force’s KC-46 tanker has been raked over the coals over the past few weeks, with the service blasting manufacturer Boeing for continued schedule delays and a couple new technical problems. But despite questions from some lawmakers about the health of the program during hearings this month, Congress added $510 million to fund an extra three KC-46s. That would bring the Air Force’s total KC-46 procurement for FY18 up to 18 tankers. Given how poor the recent issues have been this is a pretty interesting decision. Not really. The Administration wants to increase Defense Spending and the Congressional majority appears to concur with that decision - hence the 143 total additional purchases above plan across multiple programs. No, that will not happen. The Boom flow rate is determined by the number or air refueling pumps you have going (up to 4 in the KC-135 and KC-10). You select the number of pumps for that type of receiver. If you use more pumps than the receiver can handle, his various tanks fill and shut off, or the pressure in the fuel lines of the receiver increases, you will get what is called a pressure disconnect from the receptacle. The same thing happens with probe and drogue refueling. Yes, probe and drogue refueling is slower than Boom refueling. You will not burst the receiver's fuel tanks, or external tanks. Fighters, like all USAF receivers have fuel vent systems that also act as a surge system that will vent excess fuel overboard. After years of delays and technical setbacks for Boeing’s KC-46A tanker program, the U.S. Air Force is running out of patience with the aerospace giant. But Boeing has a long way to go to get the KC-46 back on track. The Air Force recently added two new Category 1 deficiencies—the most severe type—to the KC-46’s growing list of problems. The two new technical issues could further delay fielding of the aircraft, the first of which will not make it to the fleet until late 2018 at the earliest, the Air Force estimates. 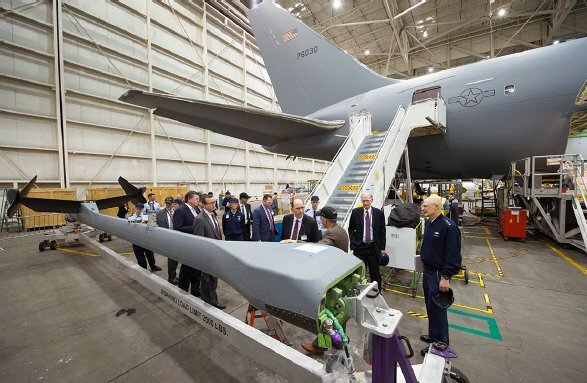 Air Force Undersecretary Matthew Donovan visited Boeing’s St. Louis plant in early March for a “deep dive” into the KC-46 problems, Wilson notes. “We have asked them to put their A-team on this to get the problems fixed and get the aircraft to the Air Force,” Wilson says. This comment, as well as the recent reorganization, raises the question: Why wasn’t Boeing’s “A-team” already working on the KC-46 program? As the article noted, Boeing Commercial generates almost three times as much revenue as Defense, Space and Security and more than four times what Global Services does. Richard Aboulafia noted that if Boeing is going to focus resources somewhere, it will be in Commercial programs (MAX, 787, 777X). He also notes that while the cost overruns are being absorbed by Boeing, the penalties for missing contracted delivery dates are "not very well defined" so Boeing may be making the decision to keep taking the hits on KC-46 because the penalties on missing contracted delivery dates on the MAX, the 787-10 and the 777X are likely "well defined" and would incur a much greater hit to the Company. Perhaps in the current climate (America First) Boeing feels confident these problems won't affect it in the longer term? Whether or not this turns out to be true will become clear in time. At this point, there is no chance the project will be cancelled or re-bid, but that would be the case regardless of which Administration was in office. That said, if they are focusing limited assets of the non-human variety on commercial versus defense, then yeah, sure, you can't just hire a new widebody factory. And sure, you can't just hire enough experienced people, ever. But it still doesn't sound like they're managing this well if they truly think they have to steal headcount from commercial to do defense right. It shouldn't be zero sum. So what is wrong with this tanker anyway? What are these Category 1 problems? I thought B has been doing this tanker work since the 1950's, piece of cake! Of course B is not putting the A-team on the KC-46...it was always a political no-lose contract. Monopolies don't have the incentive to provide great customer service. The commercial side has real completion to deal with and needs the A-teamers far more !! I pity the fool who made that decision. But it still doesn't sound like they're managing this well if they truly think they have to steal headcount from commercial to do defense right. It shouldn't be zero sum. One of the ways Boeing was able to offer the lower price than Airbus that won them the contract was by leveraging Commercial Aviation engineering staff to handle the military conversion work that had previously been handled by dedicated Defense, Space & Security personnel at sites like Wichita and San Antonio. However this has been one of the sources of the issues as these people did not have the level of experience to identify and address these issues. So what is wrong with this tanker anyway? What are these Category 1 problems? Of course B is not putting the A-team on the KC-46...it was always a political no-lose contract. This nonsense gets trotted out time and again, but if the contract was never meant to go to anyone other than Boeing, there never would have been a competition for it or Airbus would have not bothered to bid multiple times knowing they never had a chance. They won in 2008 because the USAF cheated to ensure they would win (not something one would expect if the USAF had been told to only pick Boeing) and they could have won in 2011 if they were willing to cut their gross margins deeper. Afraid I am still going to have to disagree on that point. The A330 tanker won fairly, then was protested...and even if the protest was rejected, I doubt that Congress would have ever funded an Airbus-based tanker...especially now in an "America First' political environment. Boeing has little to worry about -- Congress just purchased more KC-46's than the AF asked for. They can keep the B-team on the project...the money will keep flowing, no worries for Boeing...put the A-teamers on the 797. I doubt that Congress would have ever funded an Airbus-based tanker...especially now in an "America First' political environment. All this A /B team stuff is nonsense... First you're assuming there is the solution, materials and parts, or software are available. Second you're assuming the repair works and has been bought off by the Air Force.. Third, Boeing does not have B teams.. (OK, my bias shows)... However throwing factory people at an unsolved problem is as ludicrous as some of the comments. The Pentagon twits 'A" team mumblings are left over from some 70's management motivational slide show .. he probably also suggested that they "wire a board" to resolve the computer issues . I have little faith in military career desk-sitters having any realistic input, but fill of self importance and noise. On top of that the Air Force seems OK with accepting substandard fighters (now and in the past) with a vague promise of bringing them up to date someday at unspecified costs.. so they could be using the planes now with some service limitations. Sorry but the "KC-45" was not even eligible to be awarded the contract, much less win. It failed multiple mandatory requirements. So it could not have won even if you ignored the fact that the USAF had biased communications with its team. Oh and if you ignored that the USAF awarded points completely inconsistent with the plain English of the RFP. Most telling, the person in charge of that program was forced to retire, where he suddenly found employment with Airbus USA. Its ones of the saddest aspects of the whole thing that unlike the previous tanker contract where people went to jail, he got away with blatant rigging of a multi billion dollar contract with no real punishment. While Boeing should be doing better with this contract, I also blame the USAF which seems to have taken on the belief that it has no role in preserving a healthy supplier base with healthy and current skills for its needs. Or any oversight when its being taken to the cleaners by the near monopoly its left itself with. God help it in 10-20 years when it discovers it wants new C17 or comparable. Or it wants a fighter that doesn't cost all the money in the world to operate. It was a straight political decisions to find reasons to kill the KC-45. Boeing was deep in graft and corruption with the former 767 tanker deals. Boeing had to fire CFO Michael M. Sears and CEO Philip M. Condit. On the Air force side Darleen Druyun, Principal Deputy Undersecretary of the Air Force for Acquisition, went to prison. The most astonishing part is that Boeing was even aloud to take part in the bidding for a new tanker deal. Who was implicated in corruption regarding the KC-45A deal? The implication was made when the protest of the KC-45A award was upheld, but you knew this already. Linking this award to one where corruption was proven, even after the poster used the qualifier "he got away with it", is a butthurt fanboy move. Every new discussion of KC-46A inevitably draws a series of butthurt fanboy posts. Time to move on and deal with it, just like Airbus has, IMHO. I'm not a fanboy, please explain to me how It wasn't rigged to hell and back when one side won without even bothering to respond to one of the mandatory requirements. After they were (illegally) told multiple times they had to. Please tell me how it isn't corruption to immediately reward the person in charge of the contest with a very well paying job the second you can? You think anyone should win billion dollar contracts that fail to meet the minimum requirements? You think its appropriate for the person running that contract bid to get paid 6 figures or more by the winning bidder? Airbus and NG were playing the way the USAF plays the game, which is very very wrong and should be stopped for *everyone*, not just Airbus. The implication was made when the protest of the KC-45A award was upheld, but you knew this already. I think you misread my post. Perhaps I should have said "The implication of Airbus and NG was made when the protest of the KC-45A award was upheld". It was clear all along that the A330 was not the right plane for the USAF, but certain insiders wanted it, and almost got it. The USAF is not mandated to buy the aircraft. Yes, Congress has appropriated the funds for that specific purpose but that doesn't tie the USAF to it. So if they're not happy with KC-46, they just won't buy it. If USAF does not gain confidence in the KC-46 before Sept. 30 that money goes right back into the general fund or the USAF can request that money be appropriated for other USAF needs. Please keep the thread on topic. This is about the production, testing, and delivery of the KC-46, not a discussion on the history or the bid process. That discussion has been hashed and rehashed, and anyone wishing to revisit the issue is welcome to make a thread to do so, but it doesn't belong here. While the issue of cameras and rub points etc goes on Boeing is continuing with other parts of the certifications process as evidenced below. Boeing announced that its KC-46 Pegasus aerial tanker programme completed its fuel on-load testing, part of its overall supplemental type certificate, by successfully transferring 66,200kg (146,000lb) of jet fuel to another KC-46 during flight using the centreline boom.. The fuel transfer took place during a 3h, 40min-long flight on an undisclosed date, Boeing says. Both aircraft took off and landed at Boeing Field in Seattle and achieved the maximum fuel off-load rate of 1,200 gallons per minute. Having one KC-46 refuel another KC-46 was another step toward receiving the US Federal Aviation Administration’s supplemental type certificate, the approval Boeing needs to modify the commercial 767-2C into a military tanker. The KC-46 now has demonstrated the ability to receive fuel from three tankers in the USAF fleet: KC-46, KC-135 and KC-10 aircraft, Boeing says. It also has demonstrated refueling with other aircraft including the F-16, F/A-19, AV-8B, C-17 and A-10. To date, the programme's test aircraft have completed 2,700 flight hours and more than 2,500 contacts during refueling flights. Primarily, the KC-46 will be used to refuel other aircraft, but also must be able to take on fuel while flying to extend its operational range. The tanker’s boom system can transfer up to 4,540l (1,200gal) of fuel per minute, while the Cobham-supplied hose and drogue systems, located on both the plane's wing and centerline, enables the KC-46 to refuel probe-equipped aircraft with up to 1,510l of fuel per minute. Progress towards the Boeing KC-46 receiving its full FAA certification comes several weeks after Secretary of the Air Force Heather Wilson criticiced Boeing for what she believed will be further delivery delays of the aircraft. The USAF had expected Boeing to deliver the first KC-46 by the end of 2017. The airframe manufacturer said it would deliver by the second quarter of 2018, but the USAF believes it will miss that target date too. For its part, Boeing said in response to Secretary Wilson’s comments that it was doing all it can to deliver the tankers as soon as possible. However, the firm did not guarantee that the first batch of tankers would be delivered by the second quarter of 2018. Especially they are stealth aircraft. The scrapping issue has been around since the days of the KB-29P and KC-97. Even the KC-135 and KC-10 has been known to scrap receiver aircraft, including strealth aircraft like the F-117, B-2, F-22, and F-35. The difference here is both the KC-135 and KC-10 refueling is viewed through a window, and not cameras and TV screens of the KC-46 (BTW, the A-330MRTT/KC-30/KC-45 would have all had the same issue with scrapping stealth aircraft). Refueling in turbulant air and weather cause the most scraps, although a Boom can scrap a receiver in smooth stable air, too. Boom Operators do account for scrapping too as do receiver pilots. I don't see the scrapping issue as going away as long as we do Boom and Receptial refueling, there are to many variables, most of them are not under control of the Boom Operator or Receiver Pilots. 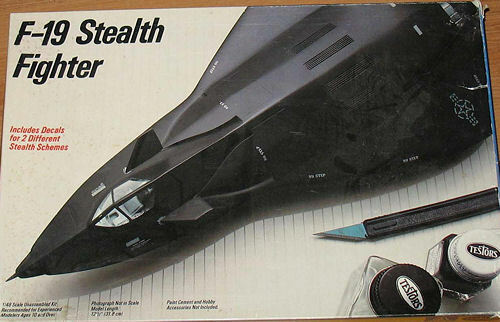 I had that gem of a game (Microprose: Project Stealth Fighter) on the Commodore 64. And had that model kit too! We can laugh now, but Microprose had people from the CIA and Air Force visiting, interviewing them how they made their "assesment" of the current Stealth Aircraft. And the "guesstimate" FA-19 does not look that different from the prototype of the time; https://en.wikipedia.org/wiki/Lockheed_Have_Blue ! And these are the guys who want to sell you their expertise. Do you have it confirmed somewhere, that the A330MRTT has the scrapping issue? AFAIK the test have gone well on those birds and they are certified for the boom refueling of those stealth frames. At least the the Australian frames since 2014. They have actively been refueling US frames in combat. somehow scrapping (the process of rendering un-useable) has become confused with scraping (the removal of matter by abrading) ..
Was giving me that headache that Rev described in the 788 context where the plane is supposedly simultaneously too light and too heavy! PS: BTW the RAAF here in Oz accepted and flew the KC-30s for years with the Boom inoperable after the serious testing incidents. Strikes me a better outcome is available for the USAF right now. The situation where the KC-10s cost a fortune while the myriad 46s sit at Everett looks and is dopey - see above. Especially when the problem basically devolves to Boeing being unable to guarantee that no stealth refuelling-customer will ever ever get scraped. Bit of leadership needed in the USAF office IMO rather than the reflexive resort to the Lawyers. The RAAF had the luxury of having no fighter aircraft that used boom refuelling, so an inoperable boom only impacted the E-7, C-17 and KC-30 which is easier to mitigate. I believe there is an issue in the background we aren’t yet aware of that is creating this friction between the two parties but yes agree some leadership from both sides wouldn't go astray. The USAF has been more aggressive with contract award and penalties the last few years. Not necessarily a bad thing but the system as a whole functions better then there is a happy medium between the two. I rarely go to "deep underlying reasons" (AKA sometimes as "Conspiracy Theories"). However the USAF office&Lawyers seem to be (mysteriously) hell-bent on enforcing the letter of the Contract no matter what; meanwhile the KC-10 squadrons can keep twiddling their thumbs. I don’t consider it a conspiracy theory, just that perhaps different parts of the USAF are treating contracts to different standards. Clearly a change from a few years ago but I wonder if the same standards are being enforced across the board. Yep. The process seems determined to toss the baby out with the bathwater, IMO. I wasn't having a shot at you BTW. Sorry if it came out like that. Consider this a silly question, but why did they decide to make things overly complicated by removing the boom window and adding a camera? I'm going to hazard a guess that from technical and structural modification standpoints it is far easier to have a camera back there than a human being.